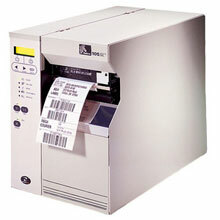 Zebra 105SL - Thermal transfer Industrial Printer (203 dpi, Wi-Fi (card included), Serial (RS-232), and Parallel interfaces, 4" max print width, 6MB DRAM, 4MB Flash, Rewinder and Peeler). Includes power supply. Cables sold separately. See accessories. The Zebra 10500-2001-2700 is also known as ZEB-1050020012700	or 1050020012700	.